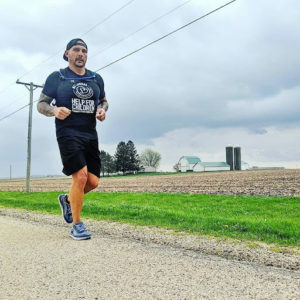 A 48-year-old who’s running across the country to raise awareness about childhood sexual abuse crossed into Iowa Wednesday. Christian Griffith says his goal is to get people to talk openly about abuse — just like they’d talk about any other disease. Griffith, who is from Atlanta, Georgia, is calling his 3000 mile trek “Run2Heal” and he’s trying to raise a million dollars for a group called “Help for Children.” The group gives grants to local child abuse prevention and treatment programs. Griffith first told someone he had been abused as a child in the fall of 2015, when he was 45 years old. Griffith began getting counseling and treatment in February of 2016 — and Griffith says he’s found talking frankly about the abuse he endured as a child is important. Griffith began skateboarding in his teenage years and then pursued more “extreme sports” as an adult because it had a calming effect. Griffith says talking openly, frankly and “loudly” about abuse is important and Griffith is making stops along the way to talk with groups about the issue. Griffith spoke with Radio Iowa shortly after he left DeWitt on Wednesday. He runs about 30 miles a day. That means it’ll take him about a week-and-a-half to run across the state. Learn more about his journey here. Today, he starts in Clarence and will end 33.9 miles later at Maddi B’s Pizza in Swisher. On May 11, He’ll run from Swisher to Ladora. After a rest day, he’ll leave Ladora on May 13 and stop 33.8 miles later in Grinnell.